It was mid May of last year. I was dreading the thought of mowing the lawn so I hadn't done it. It wasn't that long, but it was getting there. I was online, playing World of Warcraft with friends, and there was a knock on the front door. Answering it, here stood a young man offering to do yard work. He gave me a good price and said he could mow the lawn in the next 2 hours and he would pick up tree branches and haul them away. Given that I was a bit achy from my RA, sure. After mowing the lawn, he wanted to know if I wanted him to do it every week. Well, every week, particularly in the summer, is a bit much. 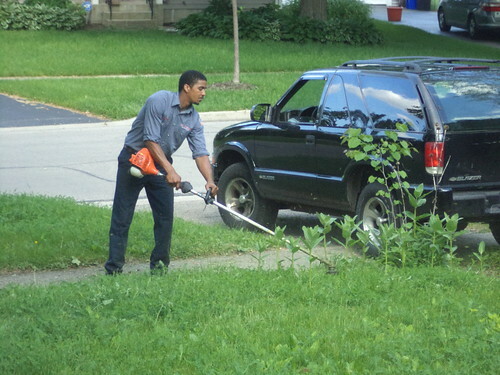 I had issues with the last lawn service I hired billing me for work I don't think they ever did. His price was good, plus, he trimmed around things and hauled away fallen branches. Over the course of the past summer, Jeremy has been my landscaper. 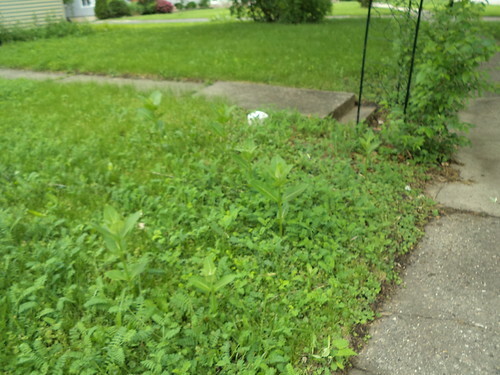 We've looked at what was overgrown and decided what needed to be handled and what I could afford. He understands how important those milkweed plants are so he carefully trims around them and we let some sections get scruffy if the milkweed is too close to be trimmed without losing one. One of the places he made a difference last year, was in the front. 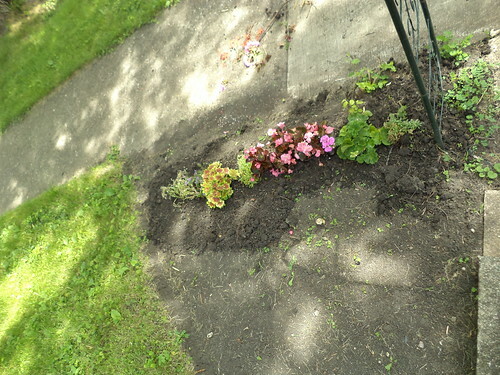 There used to be planting beds on either side of the walk. The arbor used to stand upright. Both of those things had been lost over the course of several years. The white cap is the clean out for the sewer line from the house to the street. 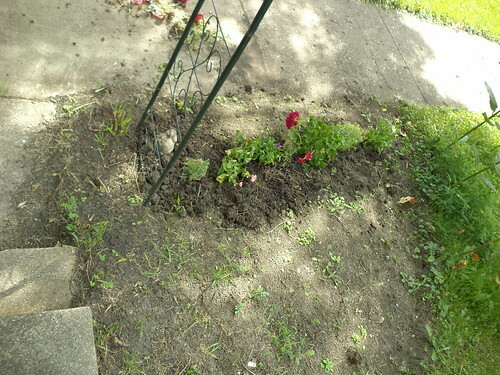 Jeremy removed all the sod from here and reawakened the beds. 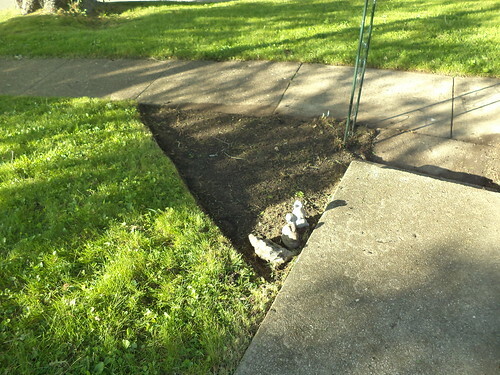 He dug up and replanted the arbor so it stands upright. I should get a new one, but that's way low on the list of things to buy for the yard. There was a volunteer tree in the north bed and he dug that up. Found the few bits of statuary I had on either side. 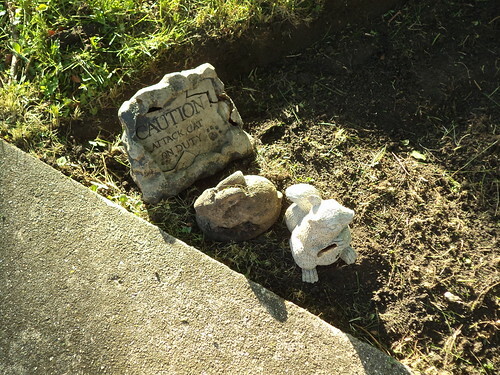 The warning sign and the squirrel were not in the best shape and had to be discarded. The rabbit is concrete and just needed to be washed off to go back in the bed. 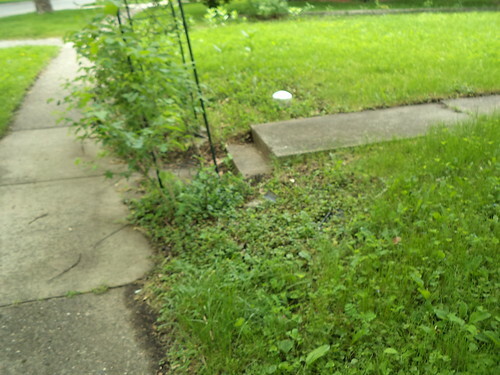 I didn't get things planted right away, so some weeds grew back, but there were a few flowers on both sides last year. It can be tough to get down on the ground and weed, but it's good for the soul. This year, I'm putting seeds in the beds. There will be sunflowers and coreopsis. I'll still fill in with a few plants, but the sunflowers I grew last year did so well, they deserve to be seen from the street. 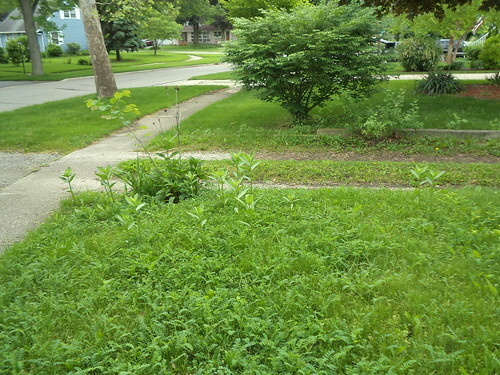 Also on the docket, will be a rehabbing of the prairie plant bed. I want to enlarge this and add more plants. The milkweed do well, but I haven't had daisies or black-eyed susans for many years. I also want to move it about a foot away from the drive. I have a tendency, when I back in, to run over the 6 inches closest to the drive. 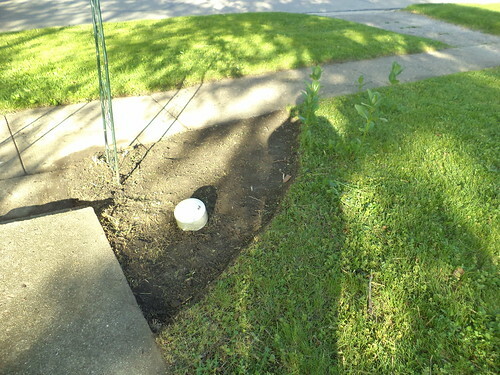 The plants which are in the bed, purple coneflower, will simply be dug up and moved. With someone to do the initial digging, I can do the planting. Enjoying your space. That's what this is all about.